YogaVibes offers a free Jade yoga mat with every annual class pass purchase. Jade is the original eco-friendly yoga company with product designs of function and quality. YogaVibes is proud to be in partnership with Jade to offer great products for everyone's home practice. YogaVibes, a premium source of online yoga videos, is excited to kick off the holiday season in partnership with JadeYoga, the world's best performing, most environmentally-friendly yoga mat company. "Jade is the original eco-friendly yoga company with product designs of function and quality. YogaVibes is proud to be in partnership with Jade to offer great products for everyone's home practice," says YogaVibes creator, Brian Ratté. 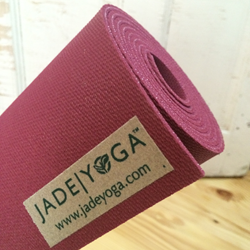 Starting now through December 31st, 2014, YogaVibes is gifting a 68” Jade Harmony Professional Yoga Mat with every annual class pass purchase. For $200, subscribers will not only receive unlimited, high-quality yoga online, but also Jade’s most popular mat, which provides practitioners the perfect balance of traction and cushion. Act now to take advantage of this special, limited-time offer*. Select the annual class pass option to gain unlimited, year-long access to YogaVibes’ 5,500+ yoga classes online. From there, select mat color preference and provide a shipping address. Subscribers will be able to choose from a variety of Jade yoga mat colors, including Midnight Blue, Purple, Black, Olive Green, Sedona Red, Slate Blue, Tibetan Orange and Raspberry to receive the yoga mat that best aligns with their vibe. *Note: This offer cannot be combined with any other discount codes. YogaVibes, a Yoga Journal partner, is the premium source for streaming online yoga classes and free online yoga videos. No more worries about making it to class on time! Stream online yoga at work, at home, in the airport - wherever, whenever! YogaVibes takes the stress out of finding time for yoga. Join now to sweat, stretch, explore, unwind, or bliss out. Subscribe now! JadeYoga is committed to making the world's best performing, most environmentally-friendly yoga mats, providing the highest level of customer service and giving back to the earth with every product made. All mats are made sustainably in the U.S. from natural rubber. They provide an optimum grip and offer better cushion and more resilience than any other yoga mat.